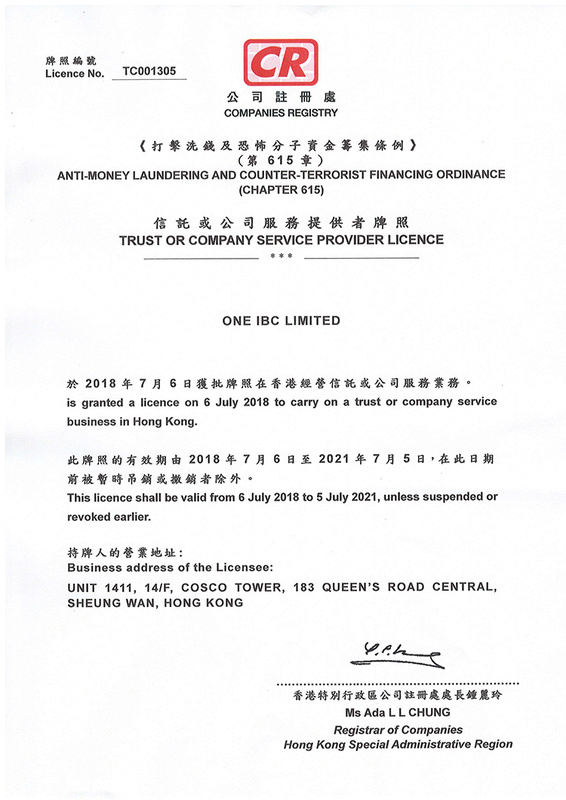 One IBC Limited has officially to be Register of Trust or Company Service Provider Licensees (TCSPs) in Hong Kong. Our name of TCSP Licensee in English is ONE IBC LIMITED with Licence No. TC001305 and business address as our head offices now in Hong Kong: Unit 1411, 14/Floor, Cosco Tower, 183 Queen's Road Central, Sheung Wan, Hong Kong. License Trust or Company Service Providers (“TCSPs”) that demonstrate we have compliance the regulatory to apply for a license from the Companies Registry that we can provide Register of Trust or Company Service Business and satisfy a “fit-and-proper” test before providing trust or company services in Hong Kong. Besides, we also comply with statutory customer due diligence (“CDD”) and record-keeping requirements under Schedule 2 of the AMLO and the licensing conditions imposed by The Registrar of Companies. Licensing regime for trust or company service providers (TCSPs) has been introduced under the Anti-Money Laundering and Counter-Terrorist Financing Ordinance (AMLO). Thanks for your regardings in this official information.